If rivers could talk, the Missouri would tell a story few other rivers could match. Upon its waters and banks was played the drama of every major theme of people's history on the Western Plains - the Indian cultures, white man's exploration, the fur trade, gold fever, the steamboat era, the collision of white expansion with the Indian's last stronghold and the resultant military occupation, and finally, the establishment of permanent white settlements, the range-cattle industry and farming. To help everyone learn about these themes in a fun, informative manner most departures that have ten or more guests are designated as "Journeys of Discovery" and are accompanied by talented authors and historians with specialized knowledge of the area. This factor alone sets ROW's Missouri River trips a word apart from most others. This Missouri River canoe trip traces the path of Lewis & Clark’s return voyage in Montana. The Missouri River's pleasant current makes this trip suitable for anyone in reasonable physical condition and is a great family vacation for paddlers age five and up. This canoe trip offers an intimate visit to the historic and scenic Upper Missouri River Breaks National Monument. To help bring a part of the river's history alive, you travel in 34' canoes that replicate those of the early voyageurs, or fur traders and are similar in size to the dugouts used by Lewis & Clark's Corps of Discovery. Each will carry up to 14 paddlers and two talented ROW guides, making the perfect platform for spinning yarns and pointing out the many points of interest along the way. For those who prefer a smaller craft, we offer the option of paddling a 17' Mad River canoe. From the launch at Coal Banks Landing, the river carries our canoes down a wide, meandering valley into the famous White Cliffs area. The White Cliffs area is a deep, rugged gorge where steep, eroded sandstone cliffs reach a height of nearly one thousand feet, revealing ten million years of geologic history. Wind and water have eroded the dazzling White Cliffs to create massive rock crags and carved castles that loom high above the river. A storybook of geology unfolds as we continue downstream from White Cliffs to the Missouri River Breaks. Summer days are typically hot and dry and the cool river water welcomes swimmers. Each night we set up our luxury camp on the Missouri's riverbanks while golden eagles, hawks and falcons gracefully soar above. Cottonwood, juniper and pine grow along the Missouri River with sagebrush, cactus and wildflowers which provide food and shelter for beaver, prairie dogs, antelope, deer, elk and big horn sheep. Highlights include: visiting camps where Lewis & Clark stayed some 200 years ago, hiking incredible eroded sandstone crags, and exploring Native American cultural sites and pioneer homesteads. The weather and water is typically very warm and wildlife is abundant. Travel from your home to Great Falls, Montana. Meet with ROW's team leader at a local hotel at 7:30 PM Pacific Time for a one hour orientation meeting to start your Missouri River canoe trip and to answer any last-minute questions and give you your waterproof bags to pack. Your adventure holiday has begun. Depart at 7:30 AM in our bus for a two-hour ride to the canoeing trip launch point. Along the way we stop for a brief visit to Montana's first town, Fort Benton. From here we continue to "Decision Point" at the confluence of the Missouri and Marias rivers. We then proceed on to Coal Banks Landing where our staff prepares you with a thorough safety orientation while your personal gear is loaded onto our cargo raft. We launch on the river and enjoy paddling a few miles before stopping for a delicious riverside lunch. We canoe on the Missouri between 8 and 11 miles the first day and arrive at camp around 4:30 PM. After you carry your personal gear to the tent of your choice, enjoy free time for swimming, hiking, reading or just relaxing. Hors d'oeuvres are served around 6:00 followed by dinner around 7:30. After dinner a campfire is lit and an evening of laughter and sharing begins. We wake you around 7:00 AM with the smell of fresh-brewed coffee. Breakfast is served around 7:30 and while we clean up the kitchen you pack up your personal gear. The canoes and cargo raft are loaded and we depart from camp about 9:30 for an adventure-packed day of canoeing, great Western scenery and fun. Soon we arrive at Eagle Creek where Lewis and Clark camped on the night of May 31, 1805. We spend several hours hiking in the vicinity of Eagle Creek and Neat Coulee. After lunch we paddle in our canoes downstream passing Citadel Rock, a massive igneous intrusion immortalized by German Prince Maximilian's artist Karl Bodmer in 1833. We arrive in camp by 4:00 PM with plenty of time to hike to the "Hole-in-the-Wall," swim in the Missouri River and relax. After dinner and the evening campfire, watch for a glorious star-studded sky. We proceed on the mighty Missouri, at times paddling and others just drifting with the gentle current. The impressive landmarks of Steamboat Rock and Dark Butte loom on the horizon. We pass the May 30, 1805 camp of Lewis and Clark. They stopped here after a miserable, rainy day on which they only made 5.4 miles. We stop at one or two pioneer homesteads and imagine life 100 years ago. Eagles soar overhead. In the late afternoon we pass Slaughter River where Lewis and Clark camped on both their upstream and downstream journeys on the Missouri. It's a satisfying day of history, paddling and nature. Tonight's camp is within walking distance of a prairie dog town and with binoculars and a spotting scope we can observe their antics and social behavior. Enjoy another night of camaraderie and sharing. As we float in our canoes today we hear the remarkable Indian legend about Arrow River. The river canyon widens and we float through the Judith Basin where the first military post, Camp Cooke, existed from 1866-1870. The Judith Basin was placed on the National Register of Historic Places in 1975 because of its rich history. Within a few miles we enter the Missouri River Breaks and a completely new landscape. Tonight's camp features a superb mud bath, excellent hiking opportunities and is our last night on the river. You may hike downstream a mile, or float, to the Hagadone Homestead where we explore old horse-drawn farm implements, the original homestead cabin and pioneer life. After a few more miles we stop for lunch then continue to our take-out point at the Stafford/McClelland Ferry, arriving around 2:00 PM. We carry personal gear to the waiting bus and climb aboard for a three-hour drive back to Great Falls. Enjoy a hot shower and change of cloths and then meet your guides for ROW's hosted dinner at a local restaurant around 7:00 PM to finish this incredible Missouri River canoe adventure. If you drove to Great Falls your car is patiently waiting for you. If you are flying, take the hotel shuttle 10 minutes to the Great Falls airport. ROW Inc. is proud to be an Equal Opportunity recreation service provider under permit from the Bureau of Land Management. Our Upper Missouri River trips are operated under permit from the Judith Resource Area of the BLM. *Custom Charter Dates Available. Please call for availability. *We need a minimum of 10 guests to confirm a departure. Please inquire if we have any bookings you may be able to join to reach the minimum number of required guests. Why go with ROW on the Missouri River? 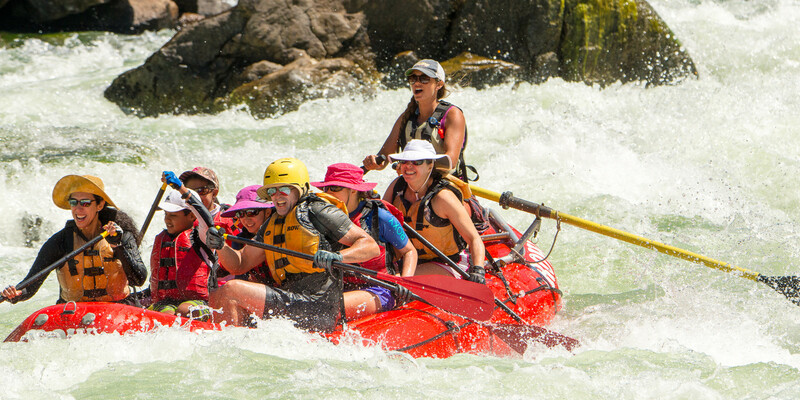 ROW Adventures is a seven-time National Geographic award-winning company. We haven't only been "operating" since 1979, we've never changed ownership! We operate following the best in "responsible" or "eco" travel ethics including Leave No Trace camping and many other best practices that are sometimes forgotten about in the world of travel. Our itinerary is designed to visit many different points of interest, taking advantage of the rich Lewis and Clark History, incredible hikes, and natural wonders in the river canyon. With a group of ten or more guests, ROW provides a Lewis and Clark Historian! Our luxury-style camping includes all camping gear such as tents, sleeping bags, and thick, self-inflating mattresses. All rafting gear is also included to make things easy for you. Your trip is enriched by knowledgeable guides who share the canyon's cultural and natural history. No other company trains guides as we do, and most of our guides are also Certified Interpretive Guides through the National Association for Interpretation. Our guides are divided into a "guest crew" and a "kitchen crew." While the kitchen crew prepares dinner, our guest crew is available to spend time with you, lead a hike, show you how to cast a fishing line or simply sit in the shade and visit. This is a fundamental distinction between us and others. Guides join you at all meals, sharing conversation and laughter at meal times and around the campfire. Complimentary beer, wine, juice, and soda, all in moderate quantities, is provided. We are proud to serve fine local Northwest wines. We always have plenty of ice! We carry satellite telephones on all trips - for emergency use only. Our trips support local hotels, for our farewell dinner we eat in a local restaurant, we hire local guides and buy all our trip provisions and food in local communities. This means our trips and the money you pay for them has a significant impact on our local area. Our trips offer an excellent opportunity for our guests to interact with locals, providing a cultural element that allows you to learn more about the American West. Are Historians provided on this tour? Yes, we provided historians on Missouri River trips with 10 or more guests. Who goes on ROW's Adventure trips? People from all walks of life and all ages join our trips. We get a mix of couples, singles, families and friends, usually between 25 and 60 years of age. Our Family MagicTM trips host kids as young as five and we've taken folks as old as 87. Some have never been camping and others have extensive wilderness experience. Some are physically challenged. Some are very active and some are not. Without exception everyone comes to have a good time and the variety of people and interests found on each trip makes it all the more fun. Our adventure consultants know that a primary consideration may be the mix of people on the trip, so we're happy to tell you who has signed up and help you choose a compatible group. Is this white water rapids on this trip? The smooth and pleasant current with no rapids makes this a trip anyone in reasonable physical condition can enjoy. The ROW style of camping is very comfortable. On most trips a cargo boat travels ahead to set up your spacious tent and a complete kitchen area. We provide thick sleeping pads, nice sleeping bags, flannel liners and pillows. Meals are served at tables with chairs and we do the dishes. Solar showers offer the chance to wash up during the trip. Summer nights in Idaho, Oregon and Montana are typically warm and some guests enjoy sleeping under the stars. If you're still concerned, give us a call. ROW is firmly committed to the responsible stewardship of the rivers we run and the earth at large. In our office, at our warehouses and on the river we abide by the 3 R's - Reduce, Reuse, and Recycle. On the river we take every possible precaution to minimize our impact. Everything we carry in, we carry out. We build our fires in metal fire pans and carry out the ashes. What about bathing and toilets? On many of our summer trips, frequent swimming leaves you feeling clean. For those who want to soap up, we always do so well above the river's high water line (not even "bio-degradable" soap goes in the river). We also take sun-showers on many of our trips and the hot water is great for shampooing. Buckets of river water help with the process. At each camp we set up a special, private tent with a portable toilet inside, which works just like yours at home, without the flush. This is available from the time we get to camp until we leave the next morning. The views from our toilet locations are simply inspiring. Nearby we set up a hand washing system. During the day, liquid waste goes in the river by simply wading into the water or going for a swim. A day-use toilet is available too for solid waste. If you have any other questions or concerns, please call our adventure consultants. For feminine hygiene, come prepared with some small zip-lock bags. These are useful for disposal during the day while on the river and can be put into our trash containers at camp. Along with our toilet supplies, ROW will have extra pads and tampons available. Using portable toilets, we carry out all human waste. Please see a special letter to women from ROW co-owner Betsy Bowen. What if there is an accident during my trip? All our guides are certified in first aid and river rescue. Many have had advanced training specific to the wilderness environment in which we operate, and are certified as Wilderness First Responders or Emergency Medical Technicians. Thus we are able to cope with most on-river accidents. If, in our judgment, evacuation is deemed necessary, we have several options, depending on weather and our location. Sometimes we are near remote ranches or roads that we can use to evacuate. We carry a satellite telephone along with a GPS on trips lasting three or more days. (Cell phones don't work in the remote areas where we travel). We can use these to contact emergency transport, including helicopters. Depending on the situation, weather and location evacuation, if needed, can take from as little as a couple of hours to as many as 24 hours, or in extreme cases, longer than this. What special gear do I need to bring? ROW provides camping gear such as tents, sleeping bags, pads, chairs and much more. You're only responsible for bringing your clothing and personal items such as toiletries, camera, etc. As for clothing, most people already have what they need. Some may need to purchase rain gear or other items. A complete list is provided along with suggested places to buy any gear you may not already own. It's important to drink plenty when you're outdoors, so ROW provides fresh drinking water at all times. In camp, there's also juice, herbal and black tea, coffee and cocoa. We provide two complimentary sodas and two beers per person, per day and complimentary wine with dinner. If you wish to bring more sodas or beer, or other alcoholic drinks to enjoy in the evening, bring them along. We'll have cocktail ice. Can I bring my camera or video camera? Yes. On multi-day trips we provide waterproof camera boxes that fit most cameras and small video cameras. Just call our office and let us know which trip you'd like to join. Or, complete our online reservation request form. You may obtain immediate confirmation by using your credit card to charge the nonrefundable trip deposit, however, confirmation is not final until we also receive a copy of your completed trip application. Otherwise we'll send you an invoice and trip application form which you need to return along with a deposit within 7-10 days of your phone reservation. (Demand for space sometimes requires us to request payment in less time in order to hold your reservation) Credit cards are accepted for deposits only - the balance must be paid by check. While it is possible to join our trips on short notice, space is limited and we recommend you sign up well in advance.